When it comes to personality type, each of us has a special gift or strength that, if fostered, can be harnessed in an incredible way. 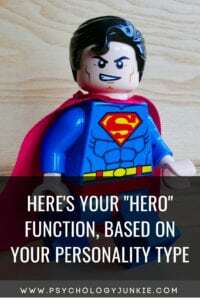 According to Jungian analyst John Beebe, our dominant function has a heroic energy, and thus is titled “the hero”. This is the function we use when we are “leading the charge” and completely sure of our direction and ability. This is the function we use when we enter a “flow” state and when we feel capable and competent. The hero function is positive, confident, and consciously controlled. You can see the role of the hero (or dominant) function in Superhero stories: It’s Thor’s ability to take charge and see tangible opportunities in the moment (Se), it’s Batman’s ability to strategize and see future implications (Ni), it’s Iron Man’s ability to brainstorm numerous possibilities and potential solutions (Ne). When we are children we often look up to people who demonstrate proficiency in our hero function. We feel like they “get” us, but they also have some mastery and mentorship to impart to us. These are often the people we see as role models in our lives. So What’s Your Hero Function? Let’s Find out! ISJs are keenly aware of patterns and when they shift or change. They are constantly comparing and contrasting what’s happening now with what has been before. This gives them an extremely reliable sense of the history of things, the background of an experience, and the memories associated with things. You’d be hard pressed to “pull something over” on an ISJ because they are well aware of your patterns of behavior, your history, and the facts related to your story. They will usually get a “gut” feeling or conviction that something is amiss because they, nearly unconsciously, can see where there is an inconsistency in a pattern and someone’s behavior or argument isn’t backed up by their past actions and experience. ISJs in hero mode are highly attentive, methodical, and have an intense awareness of the history of every situation. They use this awareness to help others, spot inconsistencies and flaws, and bring practical order and balance to the world around them. Like Commissioner James Gordon in the Batman comics, the ISJ in hero mode has integrity, a quiet ability to lead and unveil facts, and an adherence to trusted rules. While other types might bend and blow with an ever-changing set of standards and morals and ideas, ISJs are steady and determined, sticking to what they know through evidence, personal beliefs, and tried-and-true methods. Above all, ISJs strive to create security and safety for their loved ones. They uphold traditions that align with their values and they quietly and methodically work to bring all the details of their surroundings into a holistic balance of order and structure and protection. ESPs are smooth operators in heroic mode. They keep a steady head in a crisis and, above all, pay attention to the facts and objective details of the world around them. They are highly resourceful, seeing what is around them and knowing how to use it to their advantage. They are quick to act, quick to spot advantage and opportunities, and usually the first to notice a tool, detail, or object that can be used to improve a situation. Almost no other type thinks as quickly on their feet as an ESTP or an ESFP. No other types are more tuned into the moment, more keenly present, more attentive to what is happening right now. This is probably why they are overrepresented as EMTs, police officers, firefighters, or even improvisational actors or comedians. ESPs in hero mode are constantly scanning their environment for tangible opportunities; whether it’s a chance to optimize the moment, enjoy a new experience, or deal with a crisis. Instead of fantasizing about what they’d do if they had something, they work with what they’ve got around them to improve situations and make them as enjoyable as possible. Engage. Experience. Enjoy. That is the calling of the ESP. Like James T. Kirk in Star Trek, The ESP in hero mode is adventurous, daring, bold, and quick to act. They also have a wittiness and charm that makes them instantly likeable. Their ability to think quickly on their feet is second to none and this is why you’ll often see Se-dominant types as superheroes in movies (think Thor or Johnny Storm). EFJs bring people together and create unity and harmony in heroic mode. They are instantly tuned in to the emotions and needs of the people around them and know how to counsel and affirm the needs and concerns of others. They will valiantly tend to the people in their surroundings, often putting themselves in second place in the process. They are not only guided by other people’s needs, they are also guided by their strong set of core values. They are unflinching in their dedication to what they believe is right, not just for them, but for their community as a whole. Unless their values are corrupted in some ways, EFJs can be inspiring leaders for a cause they believe in that will improve the world (think Martin Luther King Jr. or Pope Francis. EFJs in hero mode are constantly scanning the emotional environment of the room they’re in to assess the “health” of everyone there. They are good at keeping morale up, inspiring confidence, and being peacemakers. Like Wonder Woman (ENFJ) or Baymax (ESFJ), the healthy Fe-dominant type is empathetic, loyal, and always on the lookout for others and how they can be of service to a greater cause. ESTJs an ENTJs in heroic mode are known for their leadership, decisiveness, and strong planning capabilities. They think quickly and logically, not letting personal bias or ever-changing emotions dissuade them from sticking to their task. They don’t mind stepping up and doing the tough work of leading in precarious or sticky situations; in fact, ETJs would almost always rather lead than follow, no matter the situation. ETJs in hero mode lead with direction, purpose, and confidence. They know how to ignore extraneous details or concerns that might get in the way of achieving their goals. They are constantly aiming for more efficiency for their team or group. They know how to put their emotions and personal feelings aside to get the job done effectively and for the good of their team, community or goal. Like Princess Leia in the Star Wars movies, ETJs in hero mode seem to inherently know how things should be done, and they are very loyal to their goals. They are hard-workers, responsible leaders, and while they might seem tough and overly-direct on the outside, they will do whatever they can to protect the values and people they care about. The ISTP or INTP in heroic mode is, above all, interested in understanding logical principles and defining and categorizing things in the most precise, accurate way. Their quest is for truth – they desire to cast aside traditional rules and question pre-established “facts”. They want to find out what the world is made up of, how things work, and to create a vast blueprint of truths to live by. The ITP in hero mode doesn’t readily accept universal principles; they need to test and experiment with things for themselves. They need to question and play devil’s advocate, they need to understand all the pieces of the puzzle before they’re ready to make an absolute statement about anything. ITPs in hero mode are analytical, rational, questioning, concise, and driven by accuracy. They try not to let their personal feelings and emotions cloud their judgment, and they believe in fairness and competence in all things. Like the character of Neo in the Matrix, the ITP in hero mode is unable to rest until they have a thorough understanding of the world and how it works and what is really true and what is really false. On the outside they may not flaunt all their knowledge, but internally they have a vast web of information properly categorized and labeled, ready for use at the exact right moment. The ISFP or INFP in heroic mode is above all driven by their deeply-held personal values. They are champions of the underdog, idealists who believe in making the world a better place. They lead with a quiet, subtle strength and determination and believe in a high level of authenticity and integrity. They are always trying to determine what something’s worth or value is on a personal level; “is this right?”, “is this wrong?”, “is this important?”, “what do my instincts tell me?”. They aren’t swayed by societal values so much as their own inner moral compass, and they aren’t afraid to be different from the crowd or stand in opposition to rules that are corrupt or based merely on majority approval. IFPs in hero mode are sincere, empathetic, and driven by their ideals and a restless inner vision of how they should live their lives. Many times they take up the cause of the suffering or people (or animals) they feel are invisible or marginalized. “Each man must look to himself to teach him the meaning of life. It is not something discovered: it is something molded. INFPs and ISFPs are very different in many ways, but all IFPs in hero mode (think Luke Skywalker or Lara Croft) will be driven by their personal values, to determine what is significant, to find out their unique calling in life. They are on a personal journey to understand themselves and to live by their deeply held values and principles. Often this means fighting for the welfare of others or using a creative medium for personal expression. The INTJ or INFJ in heroic mode is contemplative, visionary, and insightful. They are guided by an inner sense of “knowing” that is nearly unexplainable in concrete terms. They see everything from numerous perspectives and vantage points, always gazing at situations and circumstances from a detached, big picture perspective. They live in the future more than the present, always seeking to know where things will lead or how things will play out. They are drawn to complexity like a moth to the flame, always trying to decipher the underlying meaning of everything around them, never accepting things at face value. They get epiphanies or insights out of nowhere that are eerily accurate. INJs in hero mode are thoughtful, strategic, and future-focused. They tinker with ideas and theories and possibilities, looking for the most likely outcome for the future. In some ways, INFJs and INTJs are very different, but when in hero mode they both will have a great assurance of their future vision, a strong capability to see future implications, and a knack for seeing underlying meanings and hidden motives. They can have the insight of Yoda (INFJ) or the strategic wits of Lisbeth Salander (INTJ), and they will always be keeping their eye on what lies ahead. ENTPs and ENFPs in hero mode are enthusiastic, innovative, and full of ideas and possibilities. They see potential in every circumstance and can use their ability to think outside the box to get out of nearly any scrape or dilemma. They have the ability to see creative connections and relationships in what others would see as random occurrences; to the ENP everything is connected, everything is important, and everything affects everything else. They are big-picture thinkers with a determination to change the world, explore new ideas, and challenge the norm. In hero mode, ENPs are creative, imaginative, future-focused, and inventive. Where other people would see a dire situation with no way out, the ENP can usually find a novel solution, and even thrives in situations of chaos where their creativity can be challenged. Like the fictional hero Tony Stark, ENPs are able to create and innovate ingenious solutions in difficult or topsy-turvy environments. They are spontaneous, adaptable, and unafraid to question traditional practices that might impede their progress. How do you operate when you’re in “heroic” mode? How do you prefer to us your dominant function? Leave your thoughts in the comments! My bae accidentally sent me a text in which he called me an “adorable iceberg”, in reference to a recent “topsy-turvy” situation. I’m an ENFP, he’s an INTP. He’s probably correct. And I’m only starting to discover my impact.